Physician burnout is associated with two-fold increased odds for unsafe care, unprofessional behaviors, and low patient satisfaction according to one study.1 Another study concludes that electronic health records (EHR) are a leading factor in physician burnout due to the increased clerical burden and reduced efficiency associated with them.2 Like many other healthcare issues, preventing physician burnout is cheaper and safer than managing the downstream consequences. In this special report, the Risk Management team at NORCAL offer strategies to address stress caused by EHRs. 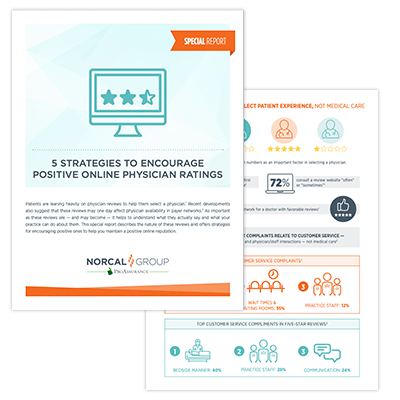 Patients are leaning heavily on physician reviews to help them select a physician.1 Recent developments also suggest that these reviews may one day affect physician availability in payer networks.2 As important as these reviews are—and may become—it helps to understand what they actually say and what your practice can do about them. This special report describes the nature of these reviews and offers strategies for encouraging positive ones to help you maintain a positive online reputation. Adolescent Health Information: Is it Confidential? The Risk Management department at NORCAL often gets calls describing treatment scenarios involving adolescents that do not neatly fit into one of the sensitive treatment categories. These situations often require the clinician to weigh the adolescent’s need for autonomy against the parents’ need to nurture, guide, and protect their child. When the line between what can and cannot be shared with a parent appears legally ambiguous, a physician’s discretion is often the best solution. Consider the following two cases. Practices must be able to protect the confidentiality of adolescent patients’ sensitive condition treatment information in patient portals. Consider the following case.